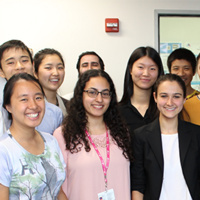 The Summer Research Training Program in Biomedical Big Data Science sponsored by the BD2K-LINCS Data Coordination and Integration Center (DCIC) is a research intensive ten-week training program for undergraduate and graduate students interested in participating in cutting edge research projects aimed at solving data-intensive biomedical problems. 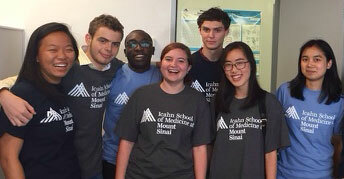 Summer fellows training in the Ma’ayan Laboratory at the Icahn School of Medicine at Mount Sinai conduct faculty-mentored independent research projects in the following areas: dynamic data visualization, machine learning and data harmonization. The BD2K-LINCS DCIC is part of the Big Data to Knowledge (BD2K) NIH initiative, and it is the data coordination center for the NIH Common Fund’s Library of Integrated Network-based Cellular Signatures (LINCS) program. The BD2K-LINCS DCIC supports data science research focused on developing methods that would further extract knowledge from LINCS data by integrating LINCS data with other relevant resources. The data science projects will address methodological and computational challenges related to such integrative analyses. The summer program is supported by the BD2K-LINCS Data Coordination and Integration Center. The Center is co-funded by the NIH BD2K and LINCS programs (NI­H grant number: U54HL127624).